Ergopose frame is height adjustable from approximately 2 feet to 4 feet high - accommodates individuals over 6 feet tall! Works well for growing and studious children as well. Strong enough to carry 352 pounds. Telescopes to accommodate table tops 4 feet to over 6.5 feet long, and 2 to 4 feet deep. Power Saving digital handset is programmable to store up to 4 preset memory options - raises and lowers the desk in second (1.5 inches per second). Additionally has child safety lock feature. 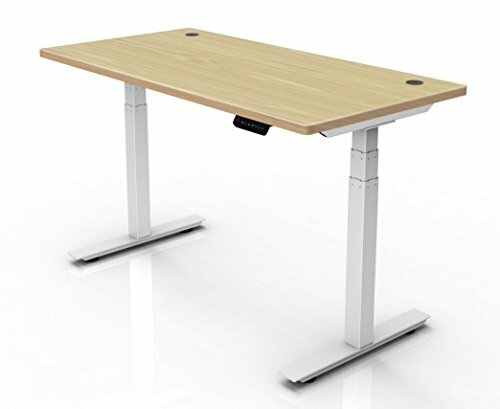 Cheaper than any dual motor other electric standing desk frame out there. Get a top from any big box retailer, be green and use your existing one, or DIY a custom top and you're set. Contact us if you are unsatisfied and we will gladly assist you or take the desk back, no questions asked. If you have any questions about this product by Ergopose, contact us by completing and submitting the form below. If you are looking for a specif part number, please include it with your message.